Tonight, there is some commotIon in the police department after the Belize Special Assignment Group - known as B-Sag made an interesting bust. According to multiple reports - the B-SAG- which is primarily made up of BDF soldiers - showed up at the Hattieville police station with 6 men, at least four of them Mexicans - and one of them is a Belizean businessman from the north. They reportedly had 2 firearms and possibly a small quantity of cocaine. But it’s important for two reasons: First, Police suspect this may be an operational link to the landing of drug planes. And, second, the pickup they were in is reportedly linked to the wife of a ranking police officer. Again, details are very scarce, and all we’re hearing from inside the department tonight is whisperings. We’ll keep following it tomorrow. Last night we had breaking news about some major drug related bust - but there was very little information coming out of the department; they kept this one under very tight wraps. And today we found out why. The Joint Operation and Intelligence Center worked from Sunday to Thursday to dismantle a drug network which handles importation and exportation by plane of cocaine. 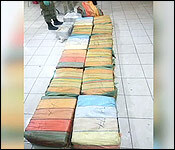 And at the end of it they came up with a huge bust: 1000 pounds of cocaine, broken down into 15 bails, and 440 parcels weighing 479.15 kilos. 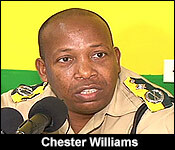 And they also detained 13 persons - including one Belizean businessman - and 5 guns. "On Sunday, 28th of October 2018 at about 10 am, based on information and intelligence received, the department placed two Guatemalans under surveillance where they were followed around in Belize City including to the location of a hotel where they were staying. On Wednesday, the 31st of October 2018, at about 6 am, we also became aware that a vessel came, Boston Whaler, into Belize and was moored at the Princess Marina, where we saw some meeting between the persons who were under surveillance and occupants of that vessel. On Thursday, the 1st of November 2018, at about 12:15 pm, again the police, via its checkpoint that was erected on the Western Highway, intercepted a Dodge Ram pickup truck which had in six occupants, one Belizean and five Guatemalans. Three of those individuals, three of the Guatemalans were in the pan at the rear of that vehicle. That vehicle was searched outside of the Hattieville area where two 9mm pistols were discovered at the back of that vehicle. On yesterday's date at about 1pm a joint team of police and BDF observed a Cessna single action airplane attempting to land in the area of the Coastal Road, approximately about 10 miles from the Democracia junction. However, for some unknown reason the plane did not land but instead circled the area three times and the joint team observed it proceeding in a southerly direction. The joint team then proceeded to search the area where they discovered silver in color Toyota Prado abandoned in the bushes. Searches in the area did not reveal any occupant in that vehicle. A search of this vehicle by the members of the team led to the discovery of 15 bales of suspected cocaine there in. 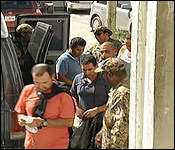 The vehicle, along with its contents were secured and escorted into Belize City. The suspected drugs were counted and it amounted to 440 parcels which, upon being weighed, amounted to 479.15 kilos of suspected cocaine. On yesterday's date also the surveillance team observed the Boston Whaler, which was moored at the Princess Marina, departing. As a result, the Belize Coast Guard, which was a part of the operation, intercepted that vessel near the vicinity of the deep water port. At the time, the vessel was heading in a southerly direction. That vessel was escorted back and is presently at the moor at the Radisson Fort George Square under guard. Ten occupants of that vessel were detained; 5 adult males, 2 adult females and three minors. The 2 adult females as well as the 3 minors were released from custody sometime last night. This vessel was searched and nothing illegal was found to date however we do intend to conduct further searches today utilizing the department's canine. Investigation is ongoing in terms of the discovery of these drugs. Several searches have been conducted within Belize City which has resulted in the detention of 2 additional Guatemalan males. Also discovered as a result of those searches were two 9mm pistols along with a 40 caliber pistol which we know in Belize is a prohibited firearm. To date, we have a total of 12 Guatemalans and 1 Belizean in custody." "Sir, would you triangulate the variables in terms of the boat, the land component and the air component. From what you all have gathered so far what was the general movement of the illicit products? Was it that it came by sea and was going to be moved over land to a point where a plane would pick it up and then it would go by plane?" "I am sorry, I cannot triangulate that at this point in time because the investigation is relatively young and I think those are some of the things the investigators will also be looking at to try and pin down." "How did the drugs enter the country?" "I understand the Belizean is a person from Orange Walk." "We have one Belizean detained; I won't go into detail in terms of who is detained." "Are you able to say how it is that you all were able to dismantle this operation? Was it intelligence? Was it confidential informant? Was it international assistance?" "Well, as I indicated perhaps part of it is a struck of luck because, as I said, we had some intelligence, we did a number of surveillances, we developed that intelligence, we saw movements and we established and went into a protocol that we have in terms of when we are looking at issues of drugs and planes and we think that a struck of luck also led us to where we are today." The 479 kilos or 1,056 pounds in this bust is comparable to the last bust which was made 52 days ago on September 9th. That one was 556.2 kilos or 1,226 pounds. So the estimated street value of this bust would be close to the 7 million US dollars estimated for the last bust. Police say they will move to get a court order to destroy the drugs as soon as possible. And while those men have been remanded for murdering a cop - the case is not so clear cut for the 13 persons detained in connection with 479 kilos of cocaine which police busted last week. Police caught 12 Guatemalans and a Belizean - and a bunch of guns, but could not find enough evidence to link them to the 479 kilos of cocaine. "We have not been able to tie any of the detainees to the drug discovery. Yes, some were charged with keeping unlicensed firearm and ammunition and that was shared to you all over the weekend. And those against whom we had no evidence, the foreigners were issued with OTL and some were charged with immigration offences and they went to court this morning." "In terms of the owner of the Prado..."
"That investigation is still ongoing." 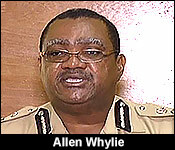 "Sir, is it a matter of frustration for the department that you all know intuitively, instinctively and factually that these persons were involved in a conspiracy to transship drugs through Belize but because of the nature of constructive evidence, that you must have, you are unable to bring charges." "We cannot take people to court based on our intuition. We are a country of laws and the rule of law is paramount and so if the evidence is not there to link anybody to whatever crime we believe they may have committed then the legal and the appropriate thing to do is to release them from custody. I don't see any failure or any incompetence on the part of the police to have been able to, like you said, cross the T's and dot the I's. It is a matter that these people were not found in the immediate vicinity of these drugs and so that is how it works. I wouldn't want to say that they get away scotch free but if the drugs were theirs then they surely have lost a huge amount of their products." "Should law enforcement have bided its time more patiently and waited until the suspects went, as they would have inevitably, to that location of the coastal highway where hundreds of kilos of cocaine were waiting for them." "Well, Jules, again, in hindsight we can say whatever but we were not there. We don't know what prompted the officers to have acted at that particular moment." As you heard, police can't prove that the Guatemalan nationals they detained were the persons trying to smuggle the cocaine that they confiscated last week. So instead, they went with charges that they can prove. Today, they marched Mario Rodolfo Lopez Moreira, Gilberto Gomez Jimenez, Marco Vinicio Palencia, Berardo de los Angeles Franco Carias, and Sergio Wilfredo Morales Godoy to court for a slew of firearms charges. Godoy and Carias were charged with 1 count of keeping an unlicensed firearm for a chrome 9 mm pistol, keeping unlicensed ammunition for 47 live rounds of 9mm bullets, keeping prohibited materials for a chrome extended magazine, keeping an unlicensed firearm for chrome and black 9mm pistol, keeping a prohibited firearm, for 0.40 mm pistol, keeping unlicensed ammunition for 39 live rounds of 9mm ammunition, keeping prohibited ammunition for 29 live rounds of 0.40 bullets, keeping a prohibited material for an extended magazine on the 9mm pistol, and keeping prohibited material for an extended magazine on the 0.40 pistol. Jimenez, Palencia, and Moreira were charged with keeping an unlicensed firearm for a 9mm pistol, keeping a prohibited material for a 0.40 extended magazine, keeping a prohibited firearm for a camouflage and chrome 0.40 pistol, and keeping prohibited ammunition for 36 live rounds of 0.40 bullets. All 5 men pleaded not guilty, but in the afternoon Carias and Moreira changed their pleas, accepting guilt. Their hope was that even with all those guns and bullets, the state would consider a fine, and not prison sentence. Also, they are hoping that the prosecution would drop the charges against other 3 defendants, which the prosecution has indicated that they are willing to do. Their attorneys attempted to convince Magistrate Emmerson Banner to forego a prison sentence for the guilty plea, since recent firearms cases in the Supreme Court has allowed a precedence to be set, where the judge can use his or her discretion in this manner. The Magistrate has adjourned the case for a few days so that he can make a careful ruling. All 5 men and 4 more have been charged and arraigned on immigration offenses. 7 have pleaded guilty to these offenses, and they have been given fines of a thousand dollars, and a removal order has been granted against them.